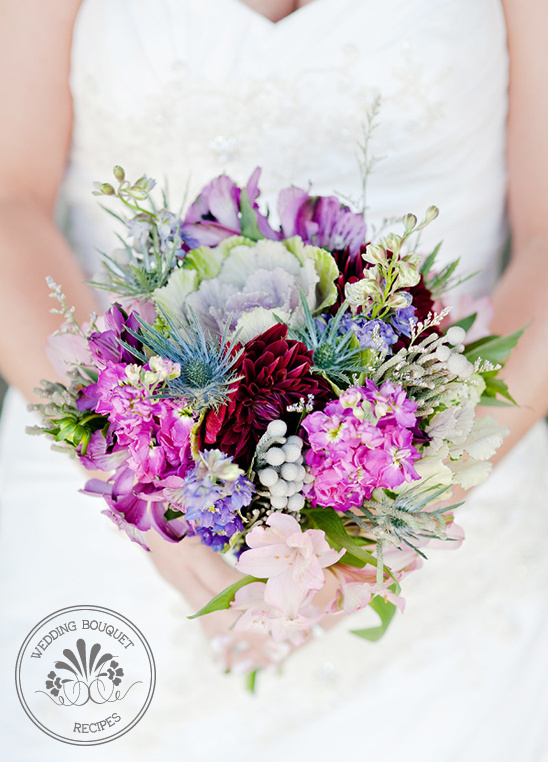 This colorful wedding bouquet has an unexpected assortment of flowering kale, thistle, alstroemeria, larkspur, misty blue flowers, raspberry stock, wine cushion mums, and silver brunia. If you are looking for a wildflower bouquet, this could be the perfect arrangement for your wedding. Be sure to remember this recipe to re-create it yourself, or take it to a florist near you. A special thanks to The Florist on 5th for creating and sharing such a beautiful and unique bouquet. Purple Flowering Kale Thistle Purple Alstroemeria Pink and Purple Larkspur Misty Blue flower Raspberry Stock Wine cushion mums Silver Brunia Hand-tied with satin ribbon Thanks to Amanda Basteen Photography for the bouquet photographs.